Clean, updated, quiet oasis in the city! 5 Beds, 2 Bath home with great location to airport, downtown OKC and Norman! 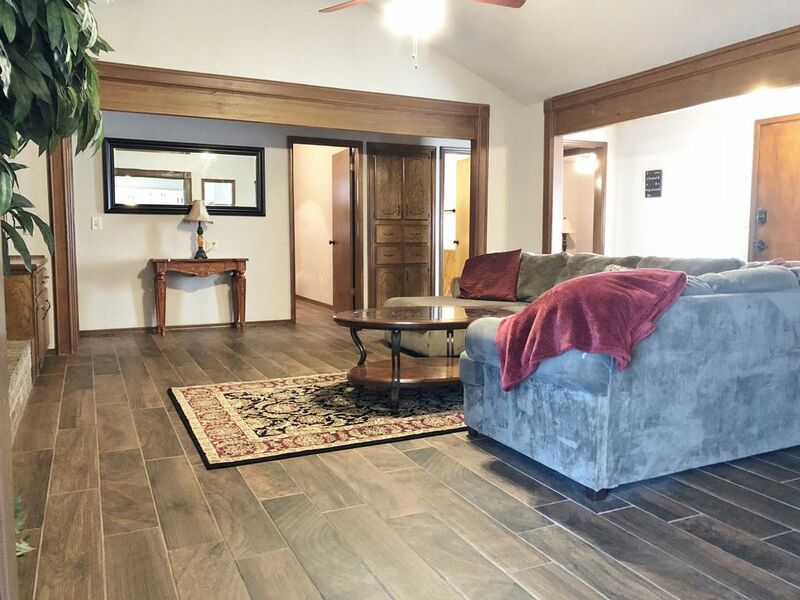 The feel of a country retreat located only 5 miles from Will Rogers World Airport and close to everything! The property is less than 1 mile from multiple grocery stores, restaurants, parks major highways and many other amenities. Plus only a 15 minute drive to downtown OKC and Norman! This full-sized home can accommodate one weary traveler or a bustling family of 10 comfortably! This home is fully stocked with all the utensils and amenities you could possibly need for a long term stay and is a dedicated VRBO/AirBnB property so that we renovated and furnished with traveler comfort in mind! I am a local Oklahoman who has been in the Real Estate Industry for 12+ years. Hospitality has become a large part of my life as we love hosting, traveling, and meeting new people! We decided to only purchase and share a home that we ourselves would want to live in. This one has everything we would want. Less than 1 mile to amenities, walk-able quiet neighborhood, large bright sun-room, tons of space, updated kitchen and baths, and a huge green area in the back to make you feel like you've left the city. The sun-room makes for a wonderful meeting area, a place to enjoy a hot cup of coffee in the morning, a reading nook, or dining room. The home backs up to a green belt area that makes you feel like you're in the country. Take a close look and you'll find a horse and longhorn grazing in the field! Plenty of green-space, parks and restaurants nearby. Bathroom one is a tub/shower combo and we have a non slip mat available. The master bathroom has a shower only. There is a 6 person dining area in the sun room and a 4 person dining area in the dining room. An assortment of board games. Large fenced back yard, backs up to a big field. Ninja blender, drip coffee machine, coffee press, Keurig, tea kettle & assorted teas, lots of coffee options stocked for your convenience. We also keep oatmeal and/or granola bars for your stay. We have filtered water and an ice maker in the fridge. Laundry: We have a washer and dryer and everything you need to do laundry; detergent, stain remover, dryer sheets, iron, ironing board. Our kitchen is well-stocked with many utensils and cookware. We frequently have guests stay over holidays and prepare big meals. We only ask that you help us clean up in the kitchen. Nice house with easy accessibility to OKC and surrounding areas. House was clean and had everything one would need. It was a great weekend. Great communication and WELL stocked! We were in town for a wedding. Everything was expected or better than expected. Jeff was quick to respond to any of our questions. The home was nice and spacious. We really enjoyed the backyard and sun room. It was stocked with everything we needed and more. Great clean place for family to gather. Many nice amenities. We found the home to be very clean when we arrived. Kitchen was well stocked including one hilariously written cookbook. Neighborhood was quiet and close to grocery stores, drugstores as well as a full liquor store. The house very easy to get too. Many board games for the kids ( and adults ). The bunk room worked well for the kids who live on opposite sides of the country. We will likely rent again when we come to town to visit our family. This was our second year staying at this property. This is such a convenient comfortable home. We just all move in and relax. We have family in the area and the house has lots of living space for us to host everyone comfortably. The owners are great to work with and very accommodating. The kitchen has been updated since the last time we stayed. Highly recommend. Carol, thanks for staying with us again! We always enjoy hosting your group.